Months ago my nightstand touch lamp finally burned out so I’ve been using a flashlight. 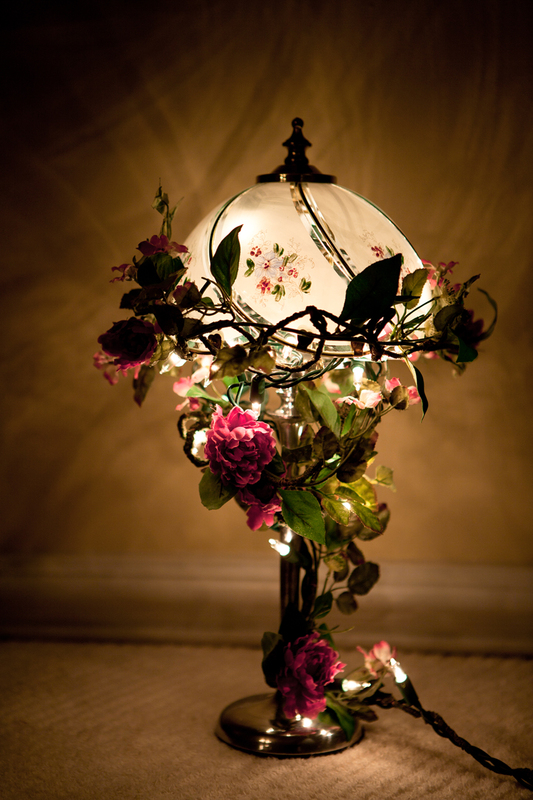 I had used that lamp on my nightstand for about 14 years and hated to part with it. It’s fairly annoying to use a flashlight as a lamp every night. Really! 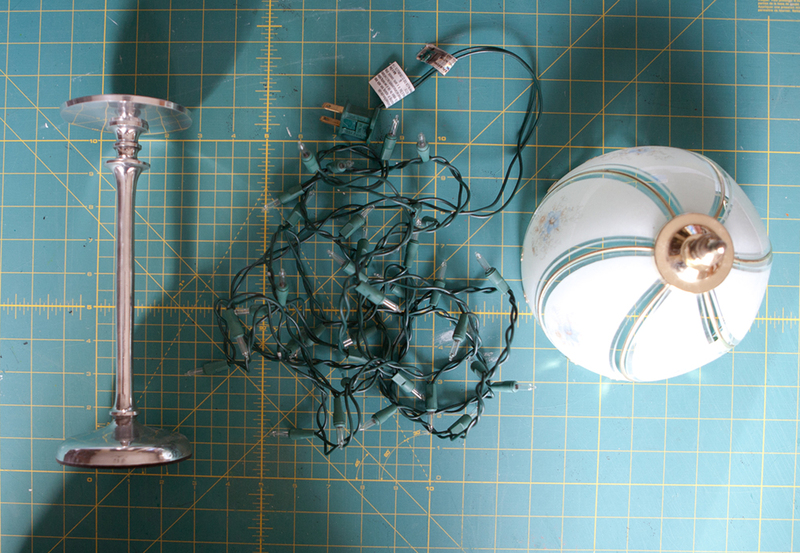 Today I took a cheap candlestick, a string of white Christmas lights and the old glass lamp shade, and made a new lamp. Not shown here are two coat hangers to fashion a frame for the top of the candlestick – much thanks to my son Noah. Also not shown are two pieces of artificial vine with flowers. The coat hanger frame was secured to top of the candlestick using pliers. The string of lights was wrapped up the candlestick and around the coat hanger frame at the top. I used pink paint to cover the orange flowers on the lampshade so it would match the pink flower vine better. Also painted green on some of the leaves. I call it my Firefly Lamp. The “fireflies” give the perfect amount of light. I love your Firefly lamp. Those tiny white Christmas lights are such an inspiration. I used them to stuff a glass window block and tied a wire ribbon bow around the block. It was the perfect “night light” Christmas package for under our tree. The little twinkle lights are perfect for wreaths, and grapevine trees. They are so relaxing. I have an extra strand this year …. mmm maybe I better think of a new project. You are so creative and innovative. Beautiful …. just beautiful.